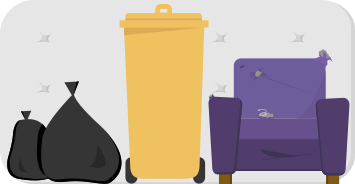 Our rubbish removal service is completely flexible, so if there is more or less rubbish when we arrive, we can adjust the price accordingly, or work to a budget. If you need help estimating, send us some photos of your waste or fill in the quote form, and we’ll get back to you usually within 30 minutes (during our opening hours). You can pay just call out fee, or you can prepay for the rubbish collection and you can still change your mind on the day if you want to adjust the size of the clearance. We have an extensive range of rubbish removal and clearance solutions, including man and van, skip bags and bags and sacks. *Price includes a £49.99 call out fee and £25 per cubic yard. Not sure how much rubbish you have? That’s no problem! Book your collection today, only pay the £49.99 attendance fee and pay for the rest on the day via debit or credit card. How much rubbish is this? How would you like to pay for your collection? Perfect if you are not sure how much waste you will have. Great if you're going to be out or prefer to pay upfront. *Only pay the £49.99 attendance fee now and the remaining charge on the day of your collection. How is the cost broken down? Your order + £49.99 call out charge per collection. 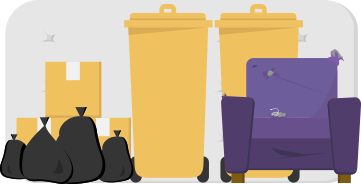 As well as our popular man and van rubbish removal service, we offer a nationwide skip bag service, with all the benefits of our man and van service such as same day collection, mixed waste streams and we’ll still pick up the bag from most locations, so it doesn’t need to be left on your drive or on the road. Our skip bag prices include free next day delivery. The small and medium bag is perfect for heavy and dense waste, while the larger sizes are perfect for bulky waste, but not suitable for construction waste or heavy and dense waste streams. Order within 4 hrs and 46 minutes and get it tomorrow! Bored of driving to the tip? Don’t have a car? Find your wheelie bin always seems to be full? 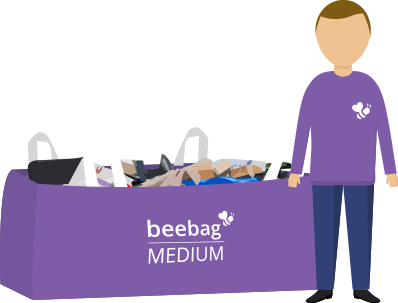 If so, our affordable, eco-friendly, on-demand bag and sack solutions for homes and businesses could be just what you’re after. We collect the very next working day, whenever you need it, with a flat rate per bag. 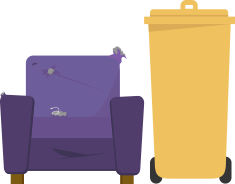 We recycle more than 90% of what we collect – we have it covered. Order within 3 hrs and 46 minutes for dispatch today! What is the Standard bag? 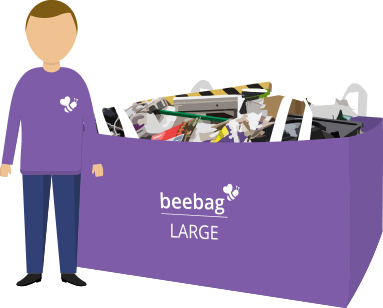 Our standard bags are perfect for household and commercial 'every day' waste. 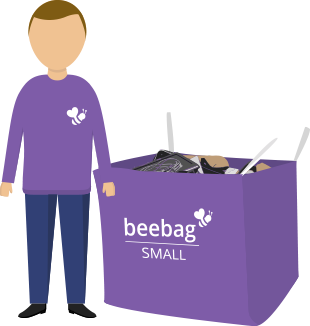 We'll also accept small 'bulky' items as long as you can fit them in the bag (if not, take a look at our large skip bags). 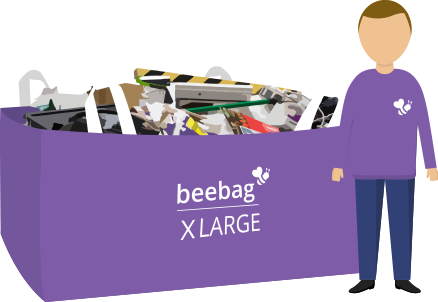 Our standard sacks come in a roll of 20 and can hold up to 10kg's, for heavier waste we would recommend our heavy bags, which are much stronger and come with a higher weight limit. Please note we cannot accept raw meat or fish or hazardous waste including paint, solvents and chemicals. Our heavy bags are made of a strong polythene and are suitable for heavy and dense waste including garden waste such as soil and construction waste such as bricks, rubble and plaster. They come on a roll of 10 and can hold up to 25kg's in each bag. Please note we cannot accept hazardous waste such as paint tins in these bags. We charge in 1 cubic yard / 0.83 cubic meter brackets, as estimated by our truck teams. This is the same size as two domestic washing machines or a fridge freezer. If you're struggling to estimate we're more than happy to help, so head over to our request a quote form, chat with us online or we can talk it through over the phone. 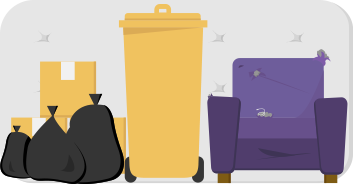 Remember our service is flexible, so if you do have extra rubbish on the day we can still clear it, although the cost will of course go up, or we can stick to a budget. Telephone: 0330 088 1000 or get a quote.